Epicenter festival — a new three-day destination music experience from premier independent U.S. music festival producer Danny Wimmer Presents — will debut in the heart of the Mid-Atlantic region, at the newly created Rockingham Festival Grounds in Richmond County, North Carolina on Friday, May 10, Saturday, May 11 and Sunday, May 12, 2019. 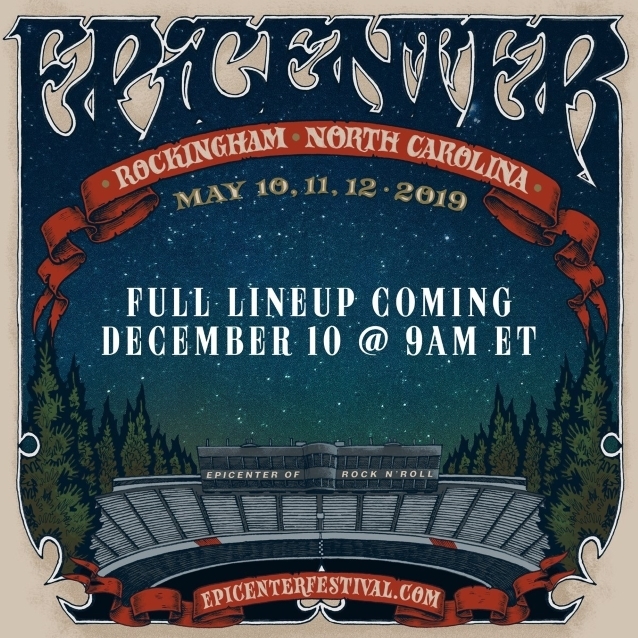 Epicenter replaces Carolina Rebellion, which was held in North Carolina from 2011 to 2018. With a move to the new venue, Epicenter offers an enhanced festival experience. The new festival grounds will be developed in coordination with Rockingham Dragway and Rockingham Speedway, with even more music, extensive camping options, and no curfew. Festival producer Danny Wimmer explains: "We are very proud of what Carolina Rebellion represented, so we understand that our decision to replace it was confusing to people. It took more time than we had hoped to make the final decision and then work out all of the details. Ultimately, we felt that there was so much more that we could accomplish in the right circumstances. The creation of the 'Epicenter of rock 'n' roll' in the heart of North Carolina gives us the ability to expand on the festival experience with enhanced camping amenities, nighttime entertainment with no curfew, and expanded food and beverage offerings, all highlighted by a massive music lineup covering the spectrum of rock, metal and alternative rock music. There's always a next level to strive for — and after eight great years of Carolina Rebellion, Epicenter is that next level." Danny Wimmer Presents CEO Danny Hayes adds: "In a project being led by the new owners of the Rockingham Speedway (the Rock), together with Richmond County, Rockingham Dragway and the other local land owners, we are working to develop a first class destination festival site. We are grateful to the Rock's Dan Lovenheim and Richmond County manager Bryan Land for spearheading this move and look forward to unveiling the lineup. Trust me, it's worth the wait." The music lineup for Epicenter and further details will be revealed on Monday, December 10 at 9:00 a.m. Eastern Time. General admission, VIP tickets, and hotel and camping packages for Epicenter go on sale Friday, December 14 at noon ET. Epicenter is produced by Los Angeles-based Danny Wimmer Presents, one of the largest independent producers of destination rock music festivals in America. DWP events include Sonic Temple Art + Music Festival, Louder Than Life, Aftershock, Welcome To Rockville, Bourbon & Beyond, Chicago Open Air and more.